Scientists have been making new progress in solving the mysteries of noctilucent clouds [also known as Polar Mesospheric Clouds (PMCs)], thanks to NASA’s Aeronomy of Ice in the Mesosphere (AIM) satellite. 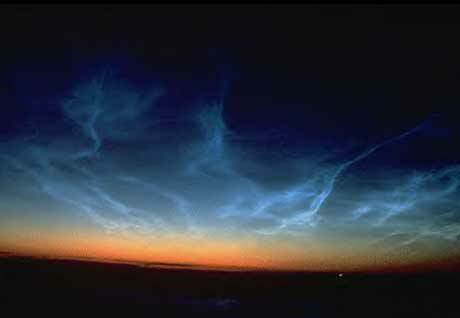 AIM recently recorded a series of complete polar seasons of these clouds, which form in the mesosphere and are only visible on Earth when illuminated by sunlight from below the horizon. The satellite’s findings “have altered our previous understanding of why PMCs form and vary,” according AIM principal investigator James Russell III of Hampton University in Virginia. AIM observed the PMCs in each hemisphere’s summer season at all longitudes and over a latitude range of 60°–85°; this video shows the clouds in the northern skies from late May to mid-August of 2009. AIM’s data revealed that the clouds form and dissipate at very high speeds and may be affected by high-altitude weather systems. “The cloud season abruptly turns on and off going from no clouds to near complete coverage in a matter of days, with the reverse pattern occurring at the season end,” Russell said. Russell likens this seasonal on-off switch to a “geophysical light bulb” in the presentation he will make about the new findings at the Space Weather Symposium during the AMS Annual Meeting in Atlanta (Tuesday, 8:30 AM, B303). Noctilucent clouds are made of ice crystals that form when water vapor condenses onto dust particles at extremely cold temperatures (around -210° to -235°F). Scientists are using the new imagery as well as computer models to figure out more about what conditions trigger the clouds. So far, the new data indicate that high altitude temperature determines the onset, variability, and end of the cloud season. Satellite imagery also seems to show relationships to planetary waves as well as smaller scale gravity waves in the atmosphere.